Teaching Artist Andrew Lipke with students from the Henry H. Houston School in Mt. Airy. For composer and musician Andrew Lipke, the value of recording an album is in the process, not the product. It's true of a lot of recordings, but most certainly in the case of an album created in collaboration with more than 30 middle-school students at the Henry H. School in Mt. Airy. Lipke, a well-regarded composer, instrumentalist and graduate from the University of the Arts, teamed with music education nonprofit LiveConnections for a one-year artist residency at the elementary and middle school. 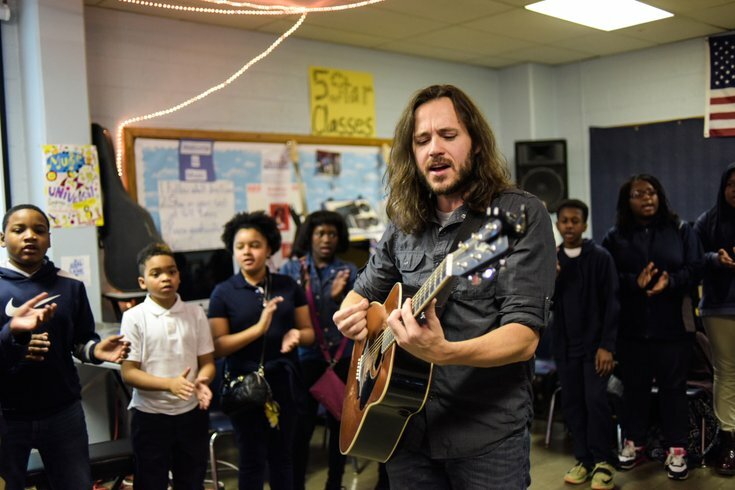 There, he and the nonprofit's co-founder, David Bradley, paired to inspire students to write and perform music that reflected their lives. "We all decided early on that we didn’t want there to be any part we had to apologize for or say in advance ‘Just remember, these are kids,'" Lipke told PhillyVoice. "We didn’t want there to be any caveat. We wanted it to be something that could stand on its own, that was enjoyable to listen to as music, that has artistic integrity and has an aesthetic appeal. That was very important to us. "But in the same moment, we wanted the process, the material, to be driven by the kids and be a reflection of their voice." What ultimately emerged was "A Day in My Life," a 16-track album that, throughout the school year, demanded students' most honest writing contributions about their daily lives and concerns. One song, "Dear Future Me," is the product of a schoolwide writing assignment in which students wrote letters to themselves in the future, posing questions as well as offering advice through spoken word. "Riddle me this, they say life's a bitter pill / Tell me, then, how does success feel?" rhymes one rap. Another, "One Life Taken, One Life Saved," takes a literal approach to the album's focus on "process," opening with recorded conversations from the group's brainstorming sessions before transitioning into a chorus that chants the titular line, which deals with gun violence in schools. 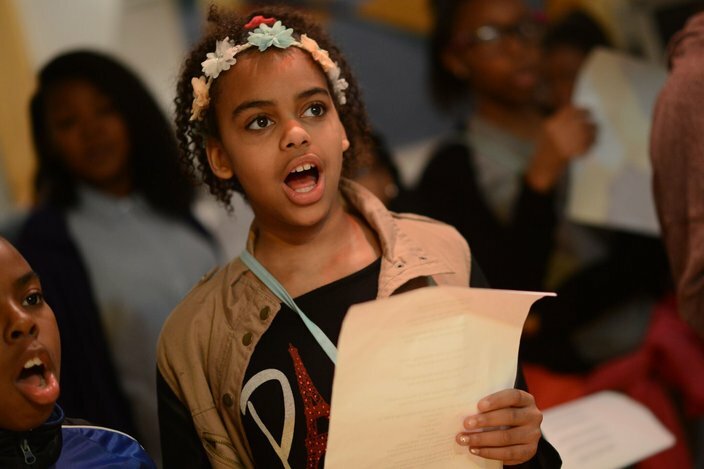 It was, Lipke said, inspired by a "breakthrough" field trip to the National Constitution Center, where the kids were taken aback by that line, introduced as part of the play "Living News." "That phrase seemed to stick with the kids," Lipke said. "One group ended up coming up with a story of characters connected to a school shooting. It got pretty deep and heavy right away — it wasn’t anything we navigated that way, it was just something the kids were drawn to trying to express. It started out powerful in that respect." Much of the album fuses spoken word with beats the students made themselves through GarageBand digital recording software. Lipke's role was to fuse these fragments of work into a cohesive recording, helping to arrange music and iron out choruses. In genre, the album tackles jazz, R&B, rap and pop styles of music. Brittney Coleman, a fifth grader at Henry H. School. Lipke has his fingers crossed that students will remember the album as a moment of triumph — a reference point for those inevitable moments when cynicism and concession set in. "I hope when they listen to the record, they remember that all of the finished pieces started as just ideas. And that, whatever idea you have, if you give it love and give it attention, and give it your hard work, you can bring it to a place where it becomes something so much more than an idea," Lipke said. "I think that process became very real to a lot of kids involved, and now I think, because they have the final product, they realize ‘Wait, this is just an idea. Somebody said "What if we did this?" and here it is —done.’"
On Tuesday afternoon, the students traveled to Harrisburg, where they were honored on the floor of the House of Representatives. The students also performed a medley of songs from the album in the rotunda of the capitol. Ultimately, Lipke's optimistic that projects like this one may influence the way the powers that be perceive the arts in school.